Cats Protection is a member of a Microchip Advisory Group (MAG), aiming to improve the standards of microchipping across the UKCats Protection is also a member of the Microchipping Alliance which is currently campaigning to make permanent identification (microchipping) compulsory for dogs and raise public awareness of the benefits of microchipping to cats and other companion animals. 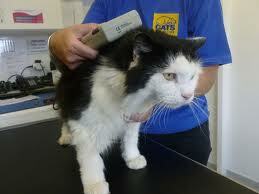 This entry was posted in Cat Welfare and tagged Cats, Cats Protection, database, microchip, pets, search. Bookmark the permalink.